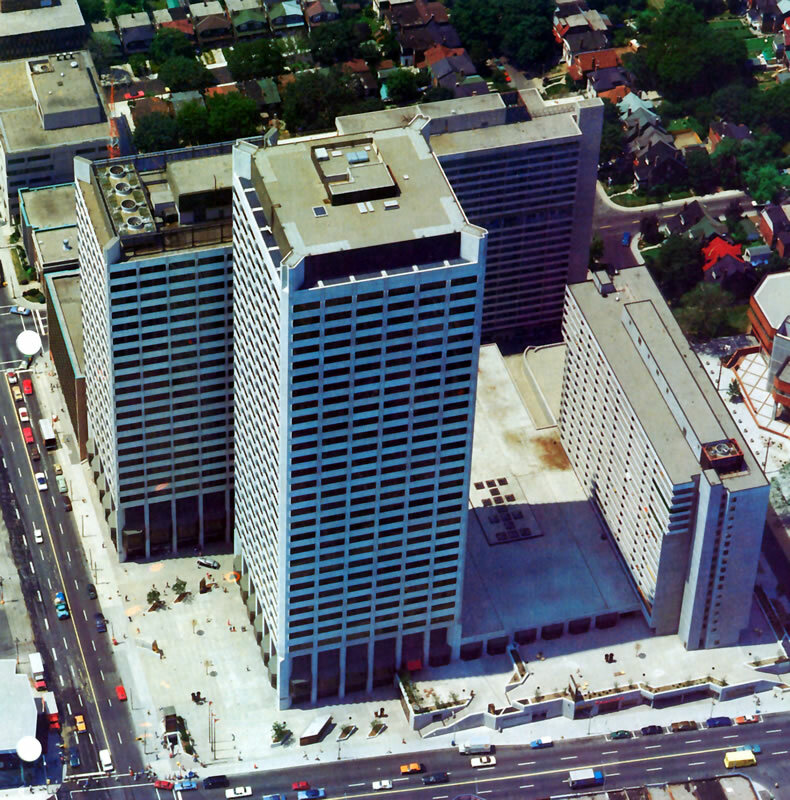 The complex incorporates two apartment blocks, two office towers and a three level shopping centre over a two level subgrade parking garage at the north-west corner of Toronto’s Yonge Street and Eglinton Avenue. The apartment blocks are reinforced concrete shear wall structures, with the shear walls penetrating through the shopping centre levels and the parking levels. The reinforced concrete character of the apartments is expressed with exposed cast in situ concrete walls and balcony parapets. The east tower is framed with nine inches thick flat slabs, with four inches deep drop panels, surrounding the central reinforced concrete core. The west office tower is framed with bonded post-tensioned beams spanning from the exterior columns to the central reinforced concrete core and supporting reinforced concrete one-way slabs . Both office towers are clad in precast panels, expressing the perimeter columns with precast spandrel panels between the columns supporting the glazing in aluminum frames.